A new report from the Women’s Philanthropy Institute explores charitable giving by women and men in the weeks surrounding the 2016 election. Although overall charitable giving in this period was lower than expected, the study found that donations to progressive charitable organizations with relevance to key election issues increased — an increase driven by female donors. 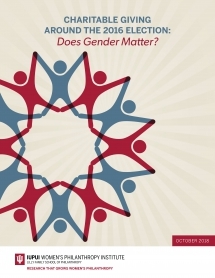 Charitable Giving Around the 2016 Election: Does Gender Matter? is the first known research to explore this development through a gender lens. The study suggests that the election was linked to charitable donations for certain charitable causes and primarily from female donors. The broader lower-than-expected giving was concentrated among men. “These findings suggest that some Americans who were moved to action following the 2016 election expressed that desire to engage with issues they care about through their philanthropy. Women led this charge, embracing charitable giving as an extension of their political engagement and using their growing financial assets to advance causes including minority rights, reproductive rights and climate action. The report has significant implications regarding how donors engage with charities — and vice versa — in today’s charged political climate,” said Debra J. Mesch, Ph.D., the Eileen Lamb O’Gara Chair in Women’s Philanthropy at the Indiana University Lilly Family School of Philanthropy at IUPUI. Overall charitable giving was lower immediately following the 2016 election than would be expected in years without a national election. Lower charitable giving after the 2016 election was concentrated among men; women’s giving increased compared to men’s giving post-election. The increase in charitable giving to relevant progressive charities after the 2016 election was driven primarily by women donors. In the week before the election, women gave more than men to these types of organizations; this giving accelerated in the week after the election as the difference between women and men’s giving increased six-fold. Charitable Giving Around the 2016 Election: Does Gender Matter? used daily transaction data from a national online donation platform. Gift data were merged with organizational information on recipient 501(c)3 organizations as well as demographic information about donors, including gender. Using this data set, this study tests if charitable giving patterns changed in the week before and the week after the 2016 election. This study looks only at the period around the 2016 election, compared to similar periods in 2015 and 2017. The Women’s Philanthropy Institute (WPI) is part of the Indiana University Lilly Family School of Philanthropy at IUPUI. WPI increases understanding of women’s philanthropy through rigorous research and education, interpreting and sharing these insights broadly to improve philanthropy. By addressing significant and groundbreaking research questions and translating that research into increased understanding and improvements in practice, WPI helps to leverage new and expanded resources for the common good. Grants from the Bill & Melinda Gates Foundation and other funders help support WPI’s research. Follow us on Twitter @WPIinsights and “Like” us on Facebook.